Wanna know what I hate most about Februarys? Even when it’s a leap year, they are super short. February this year wasn’t just a short month, it was also another busy month. Not so much business wise, but very much so in my personal life. We were busy arranging our move from Chiang Mai, Thailand to Hoi An, Vietnam. Back when it was just the two of us, we would pack our carry-ons and three hours later be on a flight to a new destination. Not sure if the little one is to blame, or if we finally matured a bit, or perhaps my wife and I are starting to get old, but it all takes a little longer now. Not to brag, but our new home in Hoi An is quite nice. Heck, I even have an office now. What more could I ask for? What excites me most about a new place though is the opportunities that await. Especially the opportunity to start with a clean slate. Got lazy in your last location? Got into a routine of snacking on junk food at night? Got routinely distracted by a TV show instead of focusing on work? No problem. It all doesn’t matter once you get to a new place. You’re starting over. Forget new year resolutions. Just move when you need to start over :). I’m kidding of course… but there certainly is some truth to it. Let’s get down to the stuff that really matters. 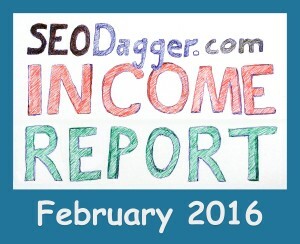 How did SEODagger.com do – income wise – for February? NOTE: As always, this report is ONLY for income generated using this blog. Anything that is generated by my dozens of other sites, side projects, and business partnerships will not be shared here. With that being said, how did SEODagger.com do? Although I still sell a bunch of copies every month, two copies sold because I linked to the site from this blog. There may have been more, but I can only confirm two. Side Note: I had this plugin developed for less than $1000 back in 2011 and have been selling it ever since (with occasional updates to keep it compatible). It has generated me and my affiliates tens of thousands of dollars since. The MyeCoverMaker review on this blog must have started ranking higher in the search engines as the commission I earned from it in February went up big time from the month before. No actual cash commission earned. I did however receive $120 in free advertising credits as a result of previous referrals ordering more credit. 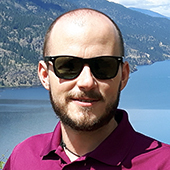 I have been recommending various services on Source Market throughout this blog and was happy to see I finally had a couple sales come through. This will hopefully pick up soon as I experiment and find more gigs worth recommending. I’ve never actually broken down what my expenses for this blog were, mostly because there weren’t any worth mentioning. It was that time of year where I had to renew the domain name again. 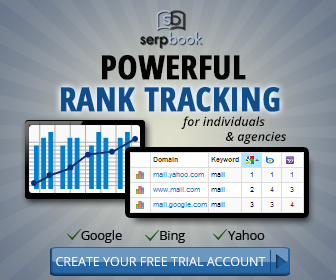 I ordered a bunch of backlinks from their PBN gig and pointed one of them at this blog. At $12 per link you simply can’t go wrong. February was not my highest overall earning month from this blog, but it was my highest actual cash earning month since I started these income reports in October of last year. After all was said and done, I took home $124.58 USD in spendable cash. Not bad! To give you an idea: With that kind of money here in Hoi An, Vietnam, I could go out for dinner every day of the month, eat a large local meal and wash it down with a large beer afterwards, and then still have money left over at the end of the month. Just one of many reasons I love South East Asia. Considering how short the month was and how little time I actually had to work on the blog, I think it did pretty good. It was definitely another step in the right direction. Since starting this “make this blog profitable” challenge 6 months ago, I haven’t had a single month where it wasn’t profitable. In fact, even when I reinvested some money into this blog (like I did for February), it came out making a profit. Which is why I recently decided to slightly increase the time I spend working on this blog each week. I know I always said it was supposed to be a very part time thing, and it will continue to be that, but I want to step things up a bit and start teaching things via video as well. As of right now I do one blog post per week and I plan on sticking with it in the foreseeable future, but am planning on doing one video per week as well. I need to make some overdue updates to the blog, and since the blog is a live case study of how I make it profitable, I want to document those updates. This will hopefully help other bloggers make the necessary updates on their blogs as well. It will allow me to tap into an existing source of targeted traffic. This blog is starting to get search engine traffic and is slowly starting to rank for lucrative keyphrases, but why depend on one source of traffic alone? They say video is the way of the future, so I’m hoping to future proof myself a bit by also using video in my marketing. My dad would have called this “killing two birds with one stone”. It’s a double win in my books. So be on the lookout for that. I will likely send out an email when my first video goes live, so be sure to opt in to my newsletter on this site (if you haven’t already done so). Also, since I don’t rely on this blog to make a living, I need to start reinvesting the money it generates to help me catapult SEODagger.com into greater success quicker. I realized that when I came across another blogger who reinvests half of all their earnings back into their blog – every month. This helped them propel that blog forward fast, resulting in quick income growth. This month (March) is the 6th month that I have actively worked towards making this blog profitable. Considering it has been profitable since month one, it’s time to bust out of “maintenance mode” and get into “growth mode”. I plan on doing that by starting to market it more aggressively through video and paid advertising methods. I will also continue to include the expenses of this blog in future income reports. The last thing I want to do is make someone believe that there are no expenses to owning a blog. Just like an offline business, running a serious blog comes with expenses. Although the cost of owning a blog is small compared to owning an offline business, it’s still worth mentioning. As always, if I missed something or you simply have a question, please leave a comment below. I like your writing style. It’s open, engaging and clear. 🙂 You’ve done quite a bit and it looks like you are open to testing ideas out and seeing where they take you. Good job. Looking forward to reading more of your older blogs and they ones you have coming up. Jenette Clay.